Rummy Circle is bringing you another installment of Sankranti Rummy Tournament from where you can win a ticket for two to Thailand. Play your best game in the qualifier rounds and avail your Thailand stay for 3 nights and 4 days. The total prize is worth Rs.5 lakh. So, get to the Rummy Circle website via your computer or mobile and book your seats for the qualifier rounds. 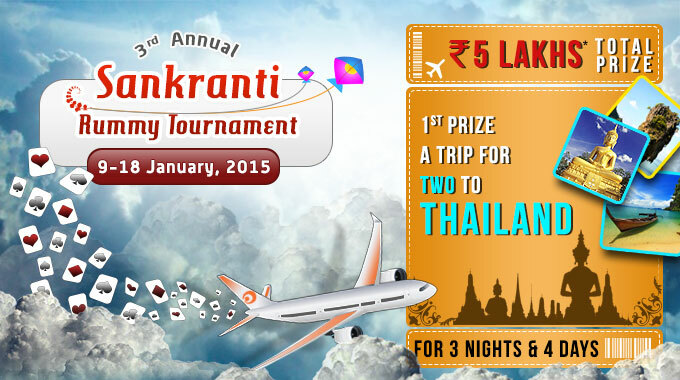 The Sankranti Rummy Tournament by Rummy Circle will begin on 9th Jan 2015 and will close on 17th Jan 2015. You can play on the qualifier rounds between 9 AM – 9 PM on these days. The tournament is open for both cash players and practice game players with Rummy Circle. You can try your luck on this tournament from the comfort your computer or mobile. The grand finale of the Sankranti Rummy Tournament will be held on 18th Jan 2015, Sunday at 3 PM. The registration to the finale will start on 9:00 AM until 2:55 PM and the Entry Fee is the ticket that you win in the qualifier round. To read about the best tournaments held by Rummy Circle, click on our Rummy Tournaments category. Feel free to drop your valuable feedbacks and suggestions on our rummy review articles. You suggestions help us in getting the best news from the online rummy world.